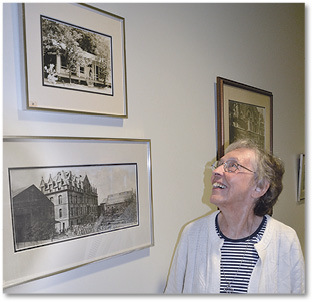 A smile graced the face of Sister Kathleen Babin CSJ as she stopped to look at a picture that was more than a half century old. In the middle of the photograph was a young woman dressed in a traditional habit, her gaze looked over the porch of a former classroom in Bay St. Louis, Mississippi. “That’s me,” she grinned, pointing to herself in the photo. Sister Kathleen is a living witness to the history of the Sisters of St. Joseph, having been around for 75 of the 150 years the order has been in the Baton Rouge area. “I’m grateful, just so grateful that the sisters came and that they were the ones that were here,” said Sister Kathleen, who graduated from St. Joseph’s Academy in 1943 and immediately entered the Sisters of St. Joseph community. The Sisters of St. Joseph are celebrating their 150th anniversary in Baton Rouge with a number of events, including a special Mass celebrated by Bishop Michael G. Duca on Oct. 21 at St. Joseph Cathedral. The Sisters of St. Joseph originally landed in Bay St. Louis from France in 1855. Two years later, they expanded their ministry to the Archdiocese of New Orleans, and on Oct. 22, 1868, four sisters arrived in Baton Rouge, via steamboat, from the Crescent City. Their mission was to take charge of an orphanage, a day school and boarding school, according to a copy of a letter found in the Archives Department of the Diocese of Baton Rouge. “The sisters who are sent will have much work but they will be able to attain great success,” wrote New Orleans Archbishop Jean-Marie Odin in his request to Reverend Mother St. Claude, for women religious in Baton Rouge. The original school was named St. Joseph’s Day School, coming from St. Joseph Church, now St. Joseph Cathedral. When the school, orphanage and convent moved in 1869 to a new, larger location on Fourth Street, it was renamed St. Joseph’s Academy. Other ministries started by the sisters in those early days included prison ministry and outreach to the poor, which became the Society of St. Vincent de Paul. But education was their main focus and the Sisters of St. Joseph were called upon to help lead and teach in other schools in the Baton Rouge area, including Sacred Heart of Jesus School, St. Thomas More School and St. George School, and the high school in New Roads, which is now Catholic High of Pointe Coupee. Sister Joan Laplace CSJ, associate director of Mission Advancement at St. Joseph’s Academy, credits the support of the Baton Rouge community for the longevity of the sisters being here. She said those initial weeks and months were near primitive, including living in one little house, taking care of themselves and of the students. Sister Joan said the sisters received assistance from such diverse sectors as grocers, farmers and bankers. “Our belief is that the Baton Rouge community at large helped us to get a foothold and for 150 years has stuck with us,” she said. “You can’t operate well without help from everybody. Sister Kathleen has witnessed much of that growth, challenges and prosperity. She was a sophomore student at SJA in 1941 when she helped the sisters move into the new school building at its current location on Broussard Street. Sister Kathleen said the old school had fallen into disrepair and the new school was a vast improvement for both students and the sisters, who still lived at the Fourth Street location and had to ride the bus daily, wearing their habits. She was only 17-years-old when she entered the order and by age 19 had taken first vows and was teaching at St. Joseph’s Parochial School. The memories of those first few years teaching are special to Sister Kathleen, who recently ran into one of her former first-grade students on a retreat. The two women have since become close friends. Sister Kathleen also remembers the changes that have occurred through the years, including after Vatican II in 1968 when habits, with their wool skirts, heavy cotton tops and two-layered veils, were no longer required. As part of the administration for her community, it was Sister Kathleen’s job to inform Louisiana bishops, where the sisters had schools, that the sisters would no longer wear habits. She still laughs when she thinks about the reaction from then-Archbishop Philip M. Hannan of New Orleans, who made one request. “He said, ‘That’s your decision what you wear, I don’t have any objection to that … but I’m going to ask you if the sisters could keep one veil.’ He said when we go to the hurricane shelters in Baton Rouge, ‘when they see that veil, it calms them down, so please save a veil,’ ” Sister Kathleen laughed. Now wearing lay clothes, the Sisters of St. Joseph continue on with an incredible love for God and for their “dear neighbor.” And, as they celebrated their own community during the anniversary Mass at St. Joseph Cathedral, they also celebrated the community that has embraced them for so long.